Atrial myxoma is the most common primary tumor of the heart. Impaired filling of the left ventricle may also be caused by a tumor in the left atrium. Atrial myxomas account for approximately 75% of these tumors in adults. Atrial myxomas are pedunculated tumors that can mimic mitral stenosis by prolapsing into the mitral valve (Fig. 16). Complaints (dyspnea, palpitations, cyanosis, syncope) that change with body position, appearing in certain positions and disappearing in others, are virtually pathognomonic for this tumor. • Atrial myxomas account for 50% of all primary tumors of the heart. • Approximately 75% of myxomas arise from the left atrium in close relationship to the fossa ovalis. Up to 15% of myxomas arise from the right atrial, with the remaining 10% arising from the left ventricle or from multiple sites. • Approximately 90% of atrial myxomas are sporadic. • 10% of atrial myxomas have an autosomal dominant transmission called Carney’s syndrome. • The prevalence of atrial myxoma is approximately 75 cases/1 million autopsies. • Average age of sporadic cases is 56 yr.
• Average age of familial cases is 25 yr.
• 70% of sporadic cases occur in females. a) Transesophageal echocardiogram of a 68-year-old woman with a left-sided atrial myxoma; 2-D image in diastole. The left atrium is above, the left ventricle is below. 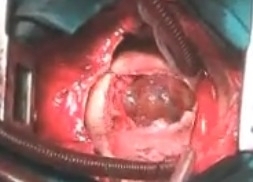 The spherical myxoma enters the mitral valve during diastole, obstructing blood flow through the valve. 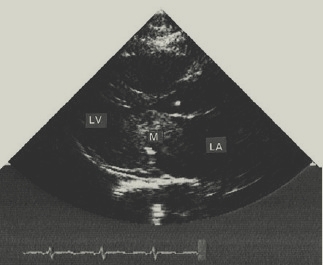 b) Color-coded Doppler echocardiogram of the same patient in systole. The myxoma is back in the left atrium. 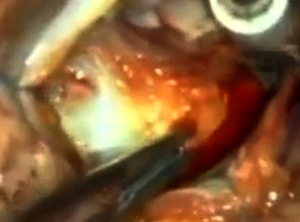 There is minimal “flame-shaped” backflow through the otherwise closed mitral valve. Clinical Features. Besides a diastolic murmur, auscultation reveals an extra systolic sound or tumor plop caused by prolapse of the myxoma during systole. Changing the patient’s position alters the intensity of the audible findings. This does not occur in mitral stenosis. The diagnosis is established by echocardiography, which can positively distinguish atrial myxoma from mitral stenosis. Atrial myxoma is associated with noncardiac systemic symptoms such as fever (50 %), weight loss (25 %), dizziness and presyncope (20 %), anemia, signs of inflammation, and splenomegaly. Chronic signs of inflammation result from the production of inflammatory cytokines by the tumor itself. Atrial myxomas may lead to the systemic embolization of tumor fragments or thrombi. These emboli, which are usually multiple, may mimic vasculitis or infectious endocarditis. • Most cases (90%) of atrial myxomas are sporadic with no known cause. In the remaining 10% of cases a familial pattern occurs having an autosomal dominant transmission. The diagnosis is easily made by echocardiography because the tumour is demonstrated as a dense spaceoccupying lesion (Fig. 16.1). Surgical removal usually results in a complete cure. A high index of suspicion is needed to make the diagnosis of atrial myxoma as the clinical manifestations are similar to many common cardiovascular and pulmonary diseases. Fig. 16.1 Atrial myxoma shown by a 2-D echocardiogram (long-axis view). 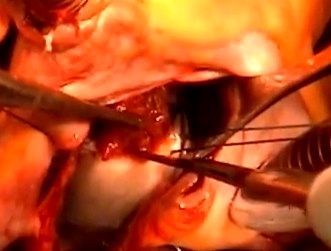 The myxoma is an echo-dens mass obstructing the mitral valve orifice. It was removed surgically. LV, left ventricle; LA, left atrium; M, mass. • Surgical excision is the treatment of choice. • Surgery should be done promptly because sudden death can occur while waiting for the procedure (see “Disposition”). Postoperative arrhythmias and conductions abnormalities were present in 26% of patients and can be treated according to standard convention. • Sudden death has been reported to occur in up to 15% of patients with atrial myxoma, with death resulting from coronary or systemic embolization or by obstruction of blood flow at the mitral or tricuspid valve.